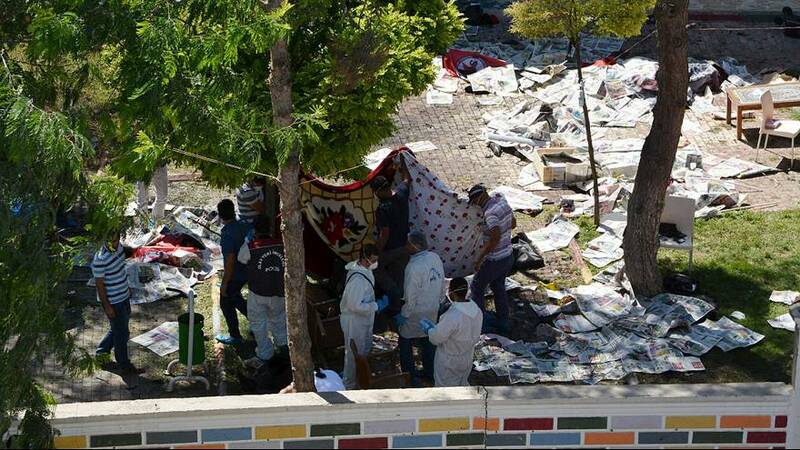 The aftermath of a deadly suicide bombing in Suruc, Turkey. At least 31 people were killed and 104 were injured in the attack. The blast ripped through a group of mostly university-aged students gathered to make a statement to the local press about a trip they were planning to rebuild Kobani across the border in Syria. Ankara says initial evidence suggests the bombing was the work of ISIL militants. Just a 15 minute drive across the border from Suruc, Kobani has become a key battleground for ISIL militants who overran the town in September last year. It was retaken by the Kurdish forces earlier this year. Demos sprung up in cities across Turkey to march in solidarity with the victims. Police broke up crowds with tear gas and water cannon after some chanted anti-government slogans, accusing them of collaborating with the so-called Islamic State group.